Wonders, William C.. "Yukon". The Canadian Encyclopedia, 10 October 2018, Historica Canada. https://www.thecanadianencyclopedia.ca/en/article/yukon. Accessed 19 April 2019. The name Yukon comes from the Gwich’in word Yu-kun-ah meaning "great river" and is a reference to the Yukon River. Lying in the northwestern corner of Canada and isolated by rugged mountains, the Yukon borders Alaska to the west, British Columbia to the south and the Northwest Territories to the east. Historically, it is indelibly associated with the great Klondike Gold Rush. Geographically the bulk of the Yukon is a subarctic plateau interspersed by mountains. The major exception is the Arctic Coastal Plain, a narrower eastward continuation of the same region in Alaska, which slopes down to the Beaufort Sea	from the British Mountains inland. The Yukon constitutes the northernmost part of the Cordilleran region. It is geologically complex but includes three parallel sectors oriented northwest–southeast. In the east, folded sedimentary Paleozoic and Mesozoic formations are set off sharply from the Mackenzie Valley by great faults. The middle sector includes sedimentaries, metamorphics and volcanics ranging from Precambrian to Mesozoic age. Massive plutonic Mesozoic and Tertiary granites make up the core of the western sector. The geologic structure is reflected in a similar physiographic subdivision into plateau and mountain regions, all of which continue westwards into Alaska. In detail there are significant variations within each major physiographic region. The high central Yukon Plateau, at an average elevation of 1,200 m, is interrupted frequently by local mountain areas and deep valleys — many of the latter strikingly aligned northwest–southeast, reflecting the structure. The 2,400 m Ogilvie Mountains on the north separate it from the Porcupine Plateau, which is delineated on the north and east by the British and Richardson Mountains, respectively. The Ogilvie Mountains bordered the traditional territory of the Tutchone in the Yukon (photo by Brian Milne/First Light). Richardson Mountains, YT, in the fall along Dempster Highway north of the Arctic Circle. Image: \u00a9 Pat Morrow. 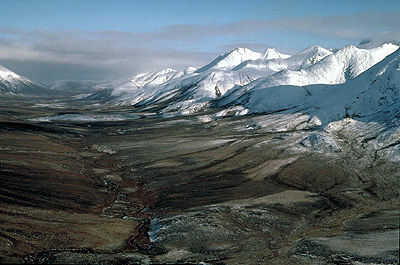 The Yukon Plateau is bounded by the Selwyn and Mackenzie mountains in the east. An area of lower terrain in the south, near the 60th parallel, separates it from the mountainous areas of northern British Columbia. 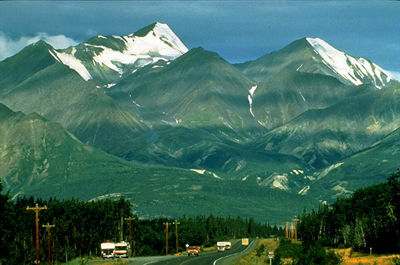 Southwestern Yukon is home to the spectacular St Elias and Coast Mountains, which rank among Canada’s highest peaks. Mount Logan (5,959 m) is the highest mountain in Canada and the second highest in North America. Many of the mountains are covered by extensive permanent ice caps — the largest nonpolar ice fields in North America — and effectively cut off direct access to the Pacific Ocean despite its relative proximity. Over 65 per cent of the territory is drained by the Yukon River system, including the Porcupine River basin north of the Ogilvie Mountains. The two major exceptions are the Peel River, which drains a lesser plateau in the northeast, and the Liard River in the lower-lying plain sector in the southeast. These rivers drain into the Mackenzie River	to the east. Included in the Yukon headwaters are elongated glacial lakes along the eastern edge of the St Elias Mountains. There are over 600 km of interconnected lakes in the region. 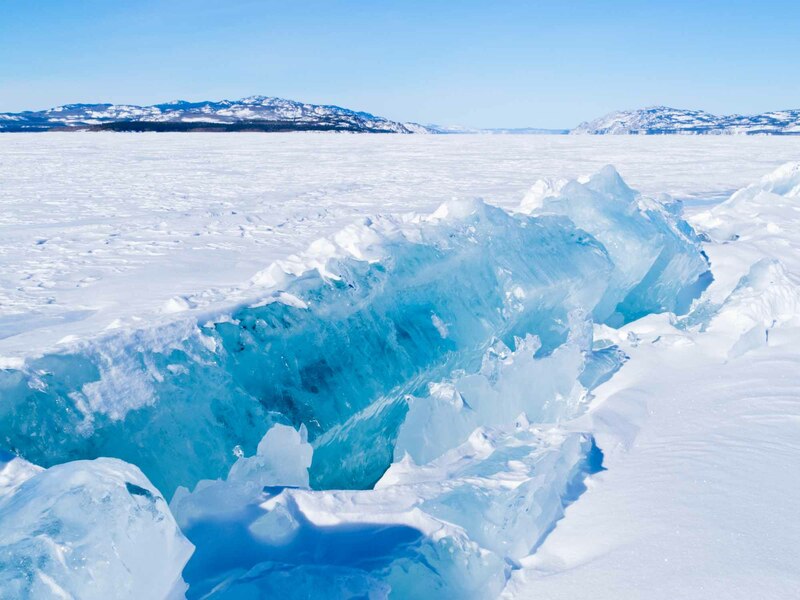 Large chunks of ice pushed upwards in a pressure ridge on wintery frozen Lake Laberge, Yukon Territory. 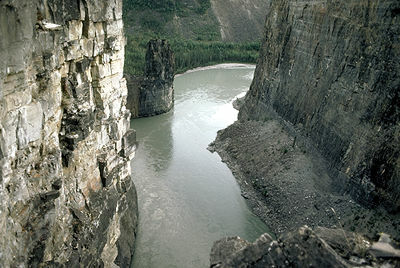 The Nahanni National Park Reserve, along the spectacular canyons cut by the South Nahanni River, is a UN World Heritage Site (courtesy Canadian Tourism Commission & Ocean Images). The Yukon includes a large area in the north and northwest that was never covered by Pleistocene ice sheets, despite its northern latitude. Permafrost is continuous north of the Porcupine River, and discontinuous but widespread through the rest of the territory. As in the Northwest Territories, the latter condition results in finely balanced biotic conditions and poses problems for construction and ground transportation. The land in Yukon, except the Arctic Coastal Plain and the higher mountains, lies below the treeline. Boreal forests	cover 57 per cent of the territory and vegetation is classified as sub-arctic and alpine. White spruce and lodgepole pine	trees are the predominant commercial tree species. The short summer seasons mean that trees grow slowly and develop into hardy, high-quality wood. The area south of Dawson is fairly well forested, especially in the river valleys, with the best stands in the moist eastern sectors like the Liard Valley. The region is also notable for native plant diversity; for example, there are over 200 species of wildflowers. Though few foreign plant species are introduced and few could thrive in this extreme climate, invasive plants are a concern in the region. The climate of the Yukon is continental, with its mountain ramparts sealing it off from most direct contact with the moderating Pacific Ocean. Winters are cold, with the lowest temperature ever recorded in Canada (-62.8°C) at Snag, northwest of Kluane Lake, in February 1947. At times, Pacific air may edge into the southwestern sectors resulting in short intervals of milder temperatures. Summers are warm and frequently hot, but cooler air from the Arctic can push southward. The hottest recorded temperature in the Yukon is 36.1°C on 14 June 1969 at Mayo. Precipitation is generally low because the high mountains in the southwest seal-off access to the moister air. Big game animals, furbearers, birds and fish have sustained Yukon's Aboriginal peoples for thousands of years, and continue to do so, especially in remote communities such as Old Crow. Yukon's wildlife resources, which fall under the jurisdiction of the territorial government, are also valued by other residents and by tourists, particularly big game hunters. The Yukon has some of North America's largest populations of grizzly bears	and Dall sheep. The caribou population is approaching 250,000; the moose population is an estimated 70,000; and there are approximately 22,000 mountain sheep. In other words, there are more caribou and twice as many moose as people in the territory. The Yukon provides critical habitat for migratory birds, such as trumpeter swans and birds of prey. The barren-ground porcupine caribou herd migrates between Alaska, the Yukon and the Northwest Territories. Pacific salmon	ascend the Yukon River and its tributaries from Norton Sound, in Alaska. Minerals, such as gold, zinc, lead and silver, remain the territory's most economic non-renewable resources. Difficult access and rugged terrain have deterred mineral development in the past; however, the Yukon now has a highly developed road system with year-round access to tidewater. Government assistance programs have aided exploration and development. Yukon's historic and spectacular scenic attractions are important tourism resources. Kluane National Park in the southwest includes Canada's highest mountain, Mount Logan, and part of what has been called the largest non-polar ice field in the world outside the Arctic and Antarctic. The first territorial park was established in 1987 on Herschel Island, and includes archaeological sites of early Aboriginal residents as well as whaling era artifacts. Coal River Springs, established three years later, is a thermal spring with dramatic descending series of limestone terraces. The Ivvavik National Park was established in July 1984, under the terms of the Inuvialuit Land Claim, to protect critical habitats of the Porcupine caribou	herd and certain species of migratory birds. The caribou herd and other wildlife populations of the area are valued subsistence resources for northern Aboriginal people. Vuntut National Park, lying above Ivvavik, was established in 1993 to protect the remainder of the Porcupine caribou's habitat as well as habitat for barren ground caribou. A federal-territorial agreement to manage the Porcupine caribou herd was signed in 1985; two years later Canada and the US signed an international treaty for the conservation of the herd. There is growing pressure within the US, however, to allow oil and gas leasing within the herd's calving grounds in Alaska, in the Arctic National Wildlife Refuge. In Canada, 12 government and private bodies oversee the welfare of the Porcupine caribou herd. In 1901 — the first census for which data on the Yukon is available — the population of the territory was 27,219. After the close of the Klondike Gold Rush the population declined to 8,512 in 1911. The population of the territory declined further to 4,157 by 1921 and would not experience significant growth until after the Second World War. It was not until 1991 that the population of the territory surpassed the number recorded in 1901. In 2016, the population of the Yukon was 35,874,which represents a 5.8 per cent increase from 2011. Whitehorse lies on a wide plain of the Yukon River (photo by Pat Morrow/First Light). In 2016, 70 per cent of the population lived in the territory’s capital, Whitehorse. Whitehorse (population 25,085) derives its name from the way the rapids of the adjacent Yukon River resemble a horse’s mane. Located in the traditional territory of the Kwanlin Dün First Nation and Ta’an Kwäch’än Council, Whitehorse is the transportation, business and service centre for the territory. Dawson lies in traditional Tr'ondëk Hwëch'in territory and was named after Canadian government geologist, Dr. George Mercer Dawson.The capital until 1953, it was the centre of the Klondike Gold Rush and, for a period, was the largest city north of Seattle and west of Winnipeg. The Yukon’s third largest community is Watson Lake (population 790, 2016) and is situated in the traditional territory of the Kaska Dena of the Liard First Nation. The community serves as a service centre for the southeastern Yukon. 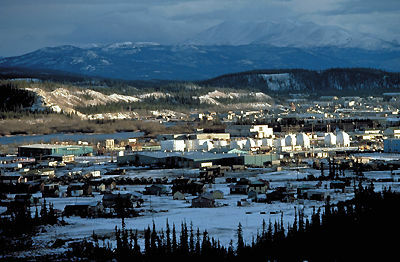 Faro, located in central Yukon, was home to one of the largest lead-zinc mines in the world. Since the mine’s closure in 1998, the rugged landscape of the Campbell region, in which the town is located, now attracts artists and tourists. In 2016, the annual unemployment rate in the Yukon was 9.2 per cent compared to a national rate of 7.7 per cent. By industry sector, the largest number of Yukoners were employed in public administration, health care and social assistance, and retail. Employment in the Yukon in many industries is seasonal, which has resulted in a migratory labour force. Those of European ancestry comprise the majority of the Yukon’s population. In 2016, the most cited ethnic origins were English, Canadian and Scottish. Visible minorities made up 8.5 per cent of the population, with Filipino, South Asian and Chinese people comprising the largest communities within this group. Aboriginal peoples make up 23.3 per cent of the population. The majority of Yukoners have English as their mother tongue (83.7 per cent), compared to 5.1 for French. In 2011, 50 per cent of the Yukon’s population identified as having no religious affiliation. Christian denominations accounted for 46 per cent of the population followed by traditional Aboriginal spirituality at one per cent. While it is one of the youngest parts of Canada in terms of European settlement, the Yukon (along with Alaska) is the oldest continuously inhabited part of North America. The earliest human inhabitants arrived via a land bridge across the Bering Strait from Asia. The date this occurred, however, is subject to considerable debate amongst archaeologists. Archaeological sites in the Old Crow basin in the north of the territory place the arrival of humans at least as early as 10,000 BCE and possibly much earlier. The majority of Aboriginal peoples of Yukon belong to the Na-Dene linguistic group. They included the Nahanni in the east (with Kaska, Goat and Mountain	groups), and several groups in the south and west (Teslin, Tutchone and Tagish). Close interaction through trade and intermarriage between the Tutchone and coastal Tlingit in the southwest resulted in strong Tlingit influences on, and even dominance of, Tutchone language and culture. In the central and northern Yukon, the Gwich’in occupied the basin of the Yukon River downstream from the mouth of the Pelly River, including the Porcupine River area to the north, and also the Peel River basin in the northeast. The geographic and linguistic boundaries between different groups are fluid and generally blend into one another. As a result, these divisions into different groups are somewhat arbitrary. As hunter-gatherers, Yukon’s Aboriginal peoples were reliant on fish, particularly salmon, and big game such as caribou, turning to smaller game as well as roots and berries in times of need. In the far north, the Inuit are culturally and linguistically distinct from the rest of Yukon’s Aboriginal peoples. 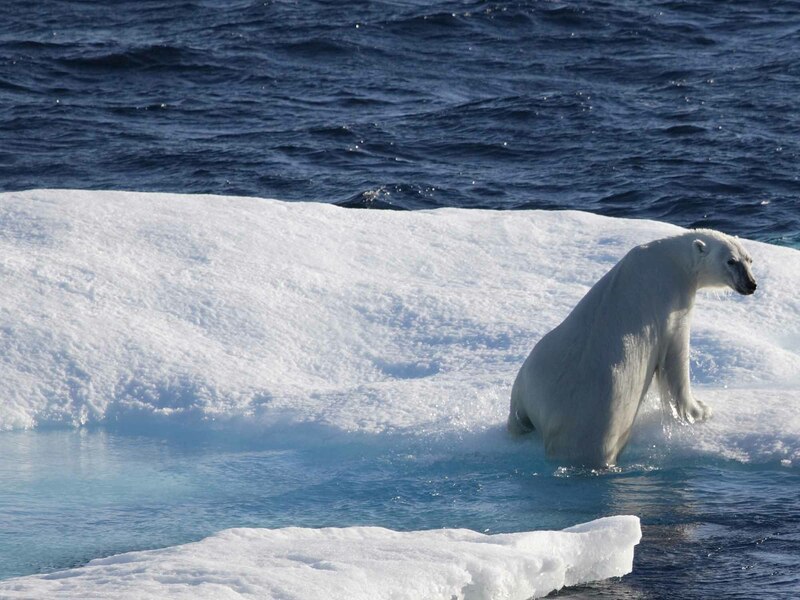 Living on Yukon’s treeless Arctic slope, they have traditionally been reliant on fish and sea mammals. See Demography of Aboriginal Peoples. Aboriginal peoples in the Yukon felt the influence of Europeans even prior to actual contact. News of the arrival of Russian explorers in the Pacific Northwest in the 1740s and British explorers in the 1770s quickly spread through pre-existing trade networks. The presence of Europeans altered these traditional networks as different groups moved to acquire a better position in the growing trade with Europeans. Along with European-made goods, diseases such as smallpox spread inland in advance of European explorers, devastating the Yukon’s Aboriginal populations. The first lasting contact was made in the 1840s by fur traders of the Hudson Bay Company, using maps and information from early explorers such as Sir John Franklin, who reached Yukon's arctic shore in 1825. Robert Campbell pushed westwards from the Mackenzie River system by way of the upper Liard onto the Pelly River and John Bell	moved into the Yukon interior via the Porcupine River. Traders in the interior and whalers on the north coast were followed by missionaries and the North-West Mounted Police	in communities such as Fort Selkirk and at Herschel Island. By the late 19th century, gold prospectors in growing numbers pushed northwards from the Cassiar and Omineca mountains of northern British Columbia. Crossing onto the Yukon watershed they worked their way along the various rivers. Others moved inland from the Bering Sea, following up the Yukon River from its mouth by stern-wheeler. Several centres of gold mining developed, often for only a brief period. Forty Mile, almost astride the Alaskan boundary, was one. George Carmack, Skookum Jim and Tagish Charley's discovery of gold on Bonanza Creek — a tributary of the Klondike River — on 17 August 1896, initiated what became the pinnacle of a series of gold rushes in western North America, stretching back to the California Gold Rush of 1849. Although there had been a greater amount of gold in California, in the Yukon, the gold was concentrated in a much smaller area. This meant that individual claims had the potential to be incredibly valuable. Three prospectors, for example, managed to recover gold worth more than a year’s wages after panning for a matter of minutes. As a result, thousands of newcomers poured into this hitherto remote corner of Canada, transforming the Yukon permanently. Most of the gold-seekers arrived by way of Skagway and the upper Yukon River. Others tried the "Overland Route" from Edmonton, via the Peace or Mackenzie rivers, but few reached their destination. Still others sought an all-American route via Valdez, AK, hoping to avoid Canadian government regulations. Between 1897 and 1899, $29 million (figure unadjusted) in gold that was recovered from the area. By 1906, however, the most easily worked placer mines were finished, leaving claims to be mined by large companies using expensive dredges. The population of Dawson began to decline almost immediately as those seeking easy riches were soon discouraged and lured by reports of gold discoveries elsewhere. Yukon's economy shifted from gold to other minerals beginning in 1913 when its first hard rock mine started silver and lead	production at Keno Hill in the central Yukon. The remote location and rugged landscape of the Yukon as well as volatile world market for minerals hindered development and prevented stability in the mining industry. The Yukon contributed several hundred men to the Canadian effort during the First World War despite having a population of roughly 7,000 in 1914. The exodus of so many men had a detrimental effect on the economy of the territory, causing labour shortages and forcing some mines to restrict operations. High fur prices made trapping an important seasonal activity in the interwar years for Aboriginal peoples and prospectors, in the absence of any other industry. The fur trade also helped create a nascent tourist industry drawing in wealthy big-game hunters. During the Second World War, the Yukon and Alaska appeared to the Canadian and American governments to be vulnerable to Japanese invasion. This spurred the construction of the Alaska Highway, the Canol pipeline and a better road infrastructure as a means of shoring up defenses in the region. These controversial projects expedited new mineral exploration activity as well as bringing people, services, industries and tourists to the Yukon. With the highway came a permanent non-Aboriginal population that outnumbered Yukon's indigenous peoples for the first time. Yukon's capital was transferred from Dawson to Whitehorse in 1953, two years after the initial announcement. In 1957, a major hydroelectric plant was built in Whitehorse. The largest economic development in the postwar years was the opening of a major open-pit lead-zinc mine and town at Faro in 1969. Low metal prices and the recession in the mid-1980s resulted in mine closures throughout the Yukon, and increased government efforts to strengthen other economic sectors such as tourism and renewable resource development. Primary resource extraction has always been the foundation of the Yukon economy. Furs, the original trading commodity, continue to be harvested and exported. Although of declining importance to the economy overall, the fur harvest remains a vital source of income. During a brief but hectic period at the turn of the century an active Arctic whaling industry was based on Herschel Island, the only sheltered harbour along the Yukon's Arctic coast. The economy is vulnerable to reversals in mining, for example, in the 1980s all of the major Yukon mines closed due to depressed world markets, resulting in a serious economic crisis and a decline in population. Farming was significant at the time of the gold rush, but subsequently became negligible because of high costs, low profits, marginal soil, climatic restrictions, topography and improved transportation that lowered the price of agricultural imports. Aided by new technologies and favourable government policy, agriculture has showed slow but steady growth. Although it remains a marginal sector, the Yukon government has been encouraging agriculture as a means of diversifying the territory’s economy. Placer gold mining was the mainstay of the Yukon's economy from the time of the Klondike Gold Rush up until the development of silver	and lead mines in the Keno Hill area in the early 1920s. Following the Second World War, placer gold production dropped off leaving silver and lead as the mainstays. During the 1960s and 1970s, several new mines were developed and production values were dominated by zinc, lead, copper, silver and asbestos. Following the closure of the asbestos and base metal mines in the late 1970s and early 1980s, and rises in the price of gold, there was renewed interest in placer mining, and a couple of small-scale hard rock gold mines operated briefly. There has also been limited production of coal intermittently since the turn of the century. Production values are now dominated by zinc, lead and silver, but placer gold	production continues to be important. There are many large mineral deposits in the Yukon and new mines are currently under development, which will likely increase the production of copper, hard rock gold and silver over the next few years. In 2013–14, there are currently three producing mines and two new mines to open, both in the Keno Hill silver district. The Yukon assets of the federal Northern Canada Power Commission were transferred to the publicly owned Yukon Energy Corp in 1987. 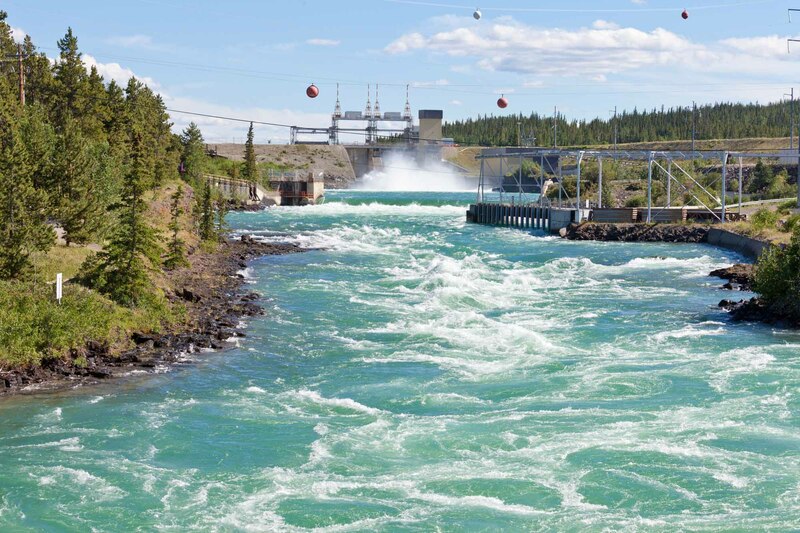 The major hydro power facilities are at Whitehorse, and on the Aishihik and Mayo rivers. In 1993, the Canada-Yukon Oil and Gas Accord transferred authority and control over onshore oil and gas resources from the federal to the territorial government. While the territory is home to potential oil and gas resources, development is limited to date. There are four hydroelectric generation facilities in Yukon located in Aishihik, Whitehorse, Mayo and Fish Lake. In 2009, hydroelectric power produced 94 per cent of all of the electricity in Yukon. The mountainous landscape of the territory means there are abundant opportunities for development of hydroelectric power though the weather does not make this process easy. Forestry is of limited importance, but the Yukon government has recently begun to promote the sector in order to diversify the economy. While a large portion of the territory is located below the tree line, only 81,000 km2 can support timber harvesting activities. For comparison, in 2010, British Columbia harvested over 168,000 hectares of forest, while the Yukon harvested 300. In the Yukon, the forest industry is dominated by small operators who extract timber for building materials, log homes and fuel wood. Yukon is home to four species of whitefish, five species of salmon and nine different game fish. Commercial fisheries harvest salmon, lake trout and whitefish for local consumption. Subsistence fishing remains important for many Aboriginal communities. The Whitehorse Rapids Fish Hatchery and Fishway protects the world’s longest migration of Chinook salmon. Their annual migration is a popular tourist attraction. The manufacturing sector is steadily contributing more to the territorial economy. Yukon-made goods include furniture, vinyl windows, trusses, printed materials, chocolates, clothing, handicrafts and gold nugget jewellery. Commercial production of the territory's renewable resources, in forestry, agriculture, fishing, trapping and sport hunting, has increased substantially in recent years. Subsistence fishing and hunting, carried out primarily by Yukon's Aboriginal peoples, represent a vital economic activity, especially in the smaller, rural communities. Tourism is the mainstay of the Yukon economy and the largest private sector employer. It is largely a seasonal industry. Along with government, it sustained the Yukon economy during recent slumps in mining. 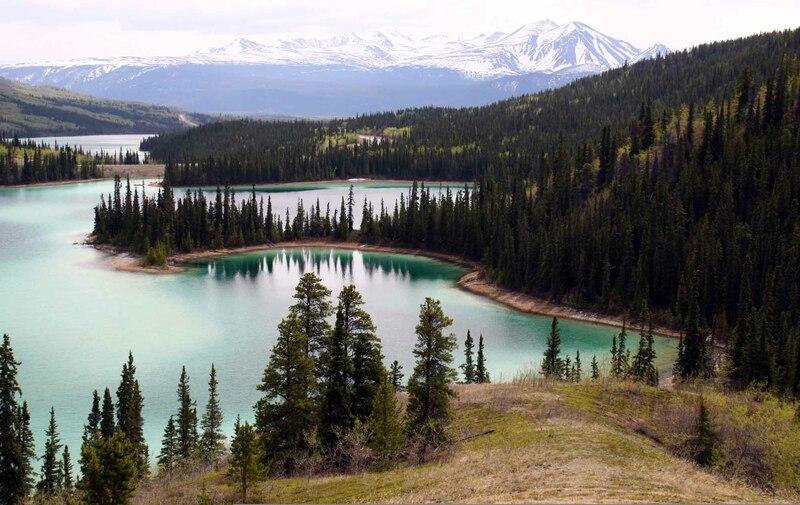 Visitors are drawn by the Yukon's colourful gold rush history, Aboriginal heritage, and scenic and wildlife attractions. In 1998, American and Canadian national parks services commemorated the 100-year anniversary of the Gold Rush by creating the Klondike Gold Rush International Historical Park, including the Chilkoot Trail through the southwestern mountains from Skagway, AK. Centennial celebrations commemorating the Klondike, as well as improved transportation infrastructure, greatly increased the number of visitors to the territory. Throughout the year, the Yukon is host to a number of festivals that celebrate the rugged landscape, the arts and territory’s history. Whitehorse puts on an annual winter festival called the "Sourdough Rendezvous," which celebrates its 50th anniversary in 2014. Dawson celebrates Discovery Day as well as an International Short Film Festival. The territory also hosts the Arctic Winter Games every six years. The remoteness of Yukon along with its variety of big game is a major draw for hunters. Non-resident hunters are required to employ the services of registered hunting guides. Other tourist services and campground facilities are available along the Yukon highways. National parks include Kluane, Vuntut and Ivvavik. The culture and history of Yukon’s Aboriginal peoples is highlighted in festivals, galleries and heritage sites. During the summer solstice, there is almost constant daylight in Yukon. It is known as, “the land of the midnight sun.” Another natural phenomenon and major tourist attraction is the Aurora Borealis	visible during the fall and spring months when the gaseous particles from the earth’s atmosphere and the charged particles from the Sun’s atmosphere are most active. The Yukon, along with Nunavut	and the Northwest Territories, is the best place to view these dazzling lights because of its proximity to a magnetic pole and due to the lack of light pollution. Transportation in the Yukon was based upon the Yukon River system until the construction of the Alaska Highway during the Second World War (the highway opened in 1948). Shallow-draught, stern-wheeler steamboats operated seasonally from gold rush days; the main route was between Dawson	and Whitehorse where rapids made the latter the effective head of river navigation. Limited transportation by sleigh or coach was available on winter roads during the closed season. The White Pass and Yukon Route Railway was constructed from tidewater at Skagway, AK, through the rugged Coast Mountains to Whitehorse, and was particularly important in exporting minerals from the territory until it was shut down in 1982. The transportation pattern and local population distribution were radically altered during the Second World War. Construction of the Alaska Highway between Dawson Creek, BC and Fairbanks, AK, in 1942 included 1,014 km through the Yukon via Watson Lake and Whitehorse. In 1978, completion of the Haines Road from Carcross to Whitehorse provided the Yukon with its first road access to the Pacific at Skagway, AK. 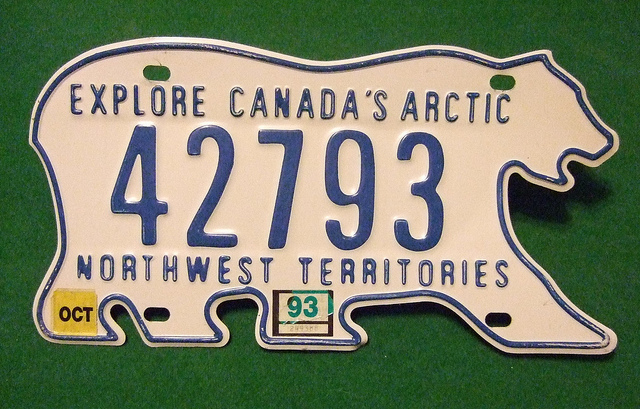 In 1979, the Dempster Highway	was completed between Dawson and Inuvik, NWT. Originally conceived as part of the government's "roads to resources" program, the Dempster Highway has helped reduce prices in the Mackenzie Delta area and has encouraged tourism. New airport facilities were constructed through the southern Yukon during the Second World War as part of the Northwest Staging Route from the US to Alaska. Airports and airstrips are now available at most Yukon settlements, including Old Crow in the north. The Whitehorse airport was built in 1985 and provides daily scheduled and charter links with Alaska, southern Canada (via Vancouver and Edmonton) and the "lower 48" American states. In 2008, the airport underwent an expansion and was renamed after Member of Parliament Erik Nielsen (Erik Nielsen Whitehorse International Airport) in December 2008. Pipelines to transport Arctic Alaskan gas overland to the US inevitably would have to cross the Yukon. The Alaska Highway pipeline proposed in the late 1970s was shelved because of political pressures in the US, the recognition of Aboriginal land claims, the environmental impacts of the project and the financial costs (see Mackenzie Valley Pipeline). 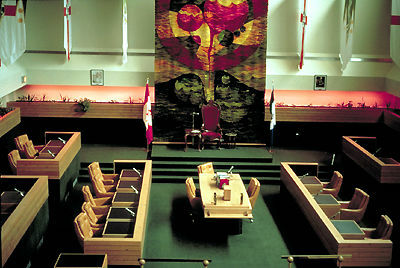 Legislature chamber at Whitehorse, YT (courtesy Canadian Circumpolar Institute, University of Alberta). The Yukon moved toward territorial government earlier than the Northwest Territories. The Yukon Territory Act (1898) created the region as a separate geographic and political entity that belonged to the Canadian federation. This legislation created a territorial government governed by a federally appointed commissioner, under who was then the Ministry of the Interior, as well as an appointed council of no more than six members. James Morrow Walsh was the first commissioner in 1897 and was succeeded a year later by land surveyor William Ogilvie. In 1908, a fully elected council of 10 members was established. Dwindling population resulted in the council and office of the commissioner being abolished in 1918. In the face of local protest it was reinstated in 1919, but only as a three-member elected council with reduced powers. Further changes did not occur until after the Second World War when the territory's population increased. In 1948, legal provision was made for the reappointment of a commissioner as chief executive officer of the Yukon, along with the installation of several other appointed territorial officers. In 1951, the council was increased to five elected members, and subsequent additions have expanded it to 17. The Yukon electorate has a choice between three parties: the Yukon Party (formerly, the Yukon Progressive Conservative Party), the New Democratic Party and the Yukon Liberals. With the exception of a brief Liberal government between 2000 and 2002, power has been traded between the conservative Yukon Party and the NDP. The Yukon Party, however, has been dominant, forming the government from 2002 to 2016. On 7 November 2016, the Liberals ended the Yukon Party’s 14-year reign, vaulting from third party status to form a majority government. Sandy Silver, previously the only Liberal member of the Legislative Assembly, was elected premier, while Yukon Party leader Darrell Pasloski lost his seat to a Liberal candidate and subsequently announced his resignation as party leader. The Liberals won 11 of the territory’s 19 seats, the Yukon Party 6 and the NDP 2. There are two major political issues for the Yukon: Aboriginal land claims and provincial status. The First Nations peoples of Yukon have never signed treaties with the federal government. Their Council for Yukon Indians (now the Council of Yukon First Nations) has pressed the case since the 1970s for a land claims settlement that would include federal government financial assistance. In 1993, an Umbrella Final Agreement between the federal and territorial governments, and the Council established the terms for finalizing land claims settlements. The Umbrella Final Agreement also included self-government agreements which give First Nations groups more control over land use and greater authority in areas such as language, health care, social services and education. Each First Nations government has responsibilities related to: law making, land-use planning, fish and wildlife, forestry, water, non-renewable and heritage resources. Provincial status was an issue during the Meech Lake and Charlottetown constitutional negotiations. When the territories were created, they did not have the same powers as provinces. In the 1960s, the Yukon became responsible for education, social services, tax collection, most highways and community services. Unlike the provinces, however, the Yukon had no authority over natural resources, with the exception of wildlife; royalties derived from resource development were paid to Ottawa. The process of devolution began in 1988. Resource management programs, including those in forestry, mines and land, have been devolved from the federal to the territorial government. In October 2001 the Devolution Transfer Agreement transferred responsibility over land and resources to the territory. In 2003, a new Yukon Act completed the devolution process with regards to land, water and resource management. Unlike the Northwest Territories councils from 1905 to 1967, Yukon's appointed officials were all residents in the territory. In 1902, one elected official represented residents of Yukon in Parliament and it was not until 1975 that the territory had representation (one senator) in the Senate. These numbers remain the true today, i.e., the Yukon has one member of Parliament and one senator representing it in Ottawa. Yukon has eight municipalities with one city (Whitehorse), three towns (Dawson, Faro	and Watson Lake), four villages (Mayo, Haines Junction, Teslin and Carmacks), three hamlets (Elsa, Ibex Valley and Mt Lorne) and another 25 unincorporated communities (including Aboriginal settlements). Hospitals are located in Whitehorse, Mayo and Watson Lake. The remainder of the territory is served by smaller health centres and nursing stations staffed primarily by a team of public health nurses. In 2011–12, there were 28 elementary and secondary schools serving the needs of 5,027 students from kindergarten to grade 12. Administration is centralized in the Department of Education. Each school has a locally elected school council, which has consultative power in the hiring and evaluation of the school's principal, and the development of rules and planning for its particular school. A school council also advises on matters such as bus schedules and local curriculum. Under the Education Act	(1990), provisions were made to ensure that each school has either a school council or school board. The Yukon Francophone School Board (Commission scolaire francophone du Yukon, CSFY) is the only such body in the territory. A school board has added responsibilities regarding staffing, operations and maintenance. Yukon school curriculum is based on the British Columbia curriculum with modifications to reflect local purposes. French immersion is offered in Whitehorse at École Émilie-Tremblay for grades 1 through 12. Instruction is also offered in various communities in seven different Aboriginal languages, and Aboriginal input, on a variety of educational matters, is coordinated through a First Nations Education Commission. Students can gain their first 2 years of university training at the college (courtesy Yukon College). 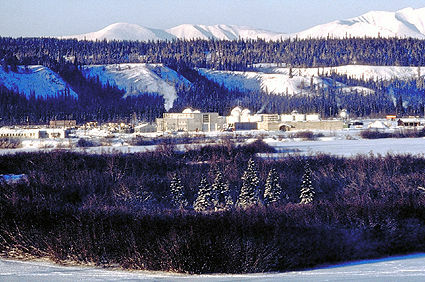 Post-secondary education programs are delivered through Yukon College's main campus (created in 1988) in Whitehorse , and its network of 13 community campuses in 12 communities. Students can obtain their first two years of university-level education through Yukon College or they can enroll in a variety of specialized diploma and trade programs. In 2011–12, the college reported over 5,700 enrolled students. In 2007, the Yukon School of Visual Arts (SOVA) was established in Dawson City by the city’s Arts Society, Yukon College and Tr’ondek Hwech’in. Students complete their first year of a Bachelor of Fine Arts at this accredited college and transfer to a partnering institution to complete their degree. There are also degree programs offered in cooperation with other institutions, such as a Bachelor of Social Work or a Yukon Native Teacher Education Program, both with the University of Regina. Yukon cultural life reflects unique northern traditions, which includes the customs and beliefs of Aboriginal people, an active Francophone community as well as vestiges (both physical and cultural) from the Klondike Gold Rush. Renowned authors Pierre Berton (born in Whitehorse), Robert Service	as well as Jack London have called Yukon their home. For an isolated northern territory, with sparsely arranged municipalities, Yukon’s annual social calendar is filled with festivals that celebrate history, the arts, and the breathtaking landscape. Aboriginal arts and crafts, feature prominently in Yukon cultural life. The Yukon Heritage Resources Board manage and preserve important archaeological sites and take part in environmental assessments necessary for planning and development. Their mandate is to protect objects of historical importance as well as act as custodians to heritage sites throughout the territory. The Heritage Resources Board, created in 1995, is comprised of 10 members. The Council of Yukon First Nations and the Yukon government each appoint five members to serve on the board for three-year terms. There is a high concentration of artists and arts in Yukon with twice the national average of artists per capita. Yukon Arts Council provides administrative support for cultural organizations and sponsors a program bringing artists into the schools, as well as annual art exhibitions and concerts. 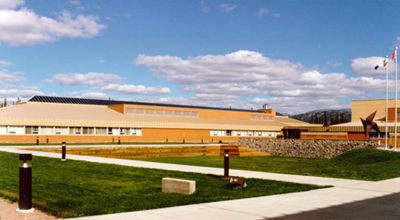 The Territorial Library and Archives are located in Whitehorse. The territorial art gallery in the new Yukon Arts Centre, located at Yukon College, maintains a collection of work by Yukon and Canadian artists, and also sponsors regular local and touring exhibitions. The Whitehorse Star is the daily newspaper based out of Whitehorse. The semi-weekly Yukon News as well as the bi-weekly L’Aurore boréale, which serves the Franco-Yukonnais community, are also published in Whitehorse. The Klondike Sun	is published bi-weekly in Dawson City. Three radio stations (CBC, CHON-FM and CKRW) and one TV station are located in Whitehorse. The history of the Yukon’s Aboriginal peoples is represented in a number of heritage sites throughout the territory. The Teslin Tlingit Heritage Centre, located in the village of Teslin, showcases everyday life of the Tlingit people through art as well as cultural traditions. Abandoned fur trading and mining sites can be found at Fort Selkirk and Forty Mile	on the Yukon River. The bowhead whaling industry, and later the fur trade	industry, resulted in settlement at Herschel Island on the north coast, designated as the Yukon's first territorial park in 1987. Ivvavik, Canada’s first national park, is located north of Old Crow. Dawson city on the edge of the Klondike and Yukon rivers. Horse buggy in Dawson City, Yukon. 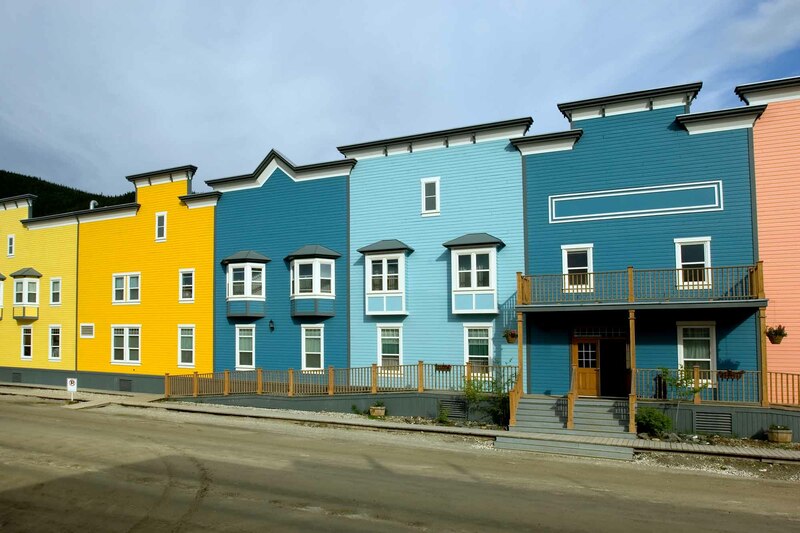 The Yukon Historical and Museums Association offers guided walking tours of Whitehorse heritage buildings in the summer and sponsors a variety of research, publication and public lecture programs. It is the umbrella heritage organization for Yukon community museums and historical societies. 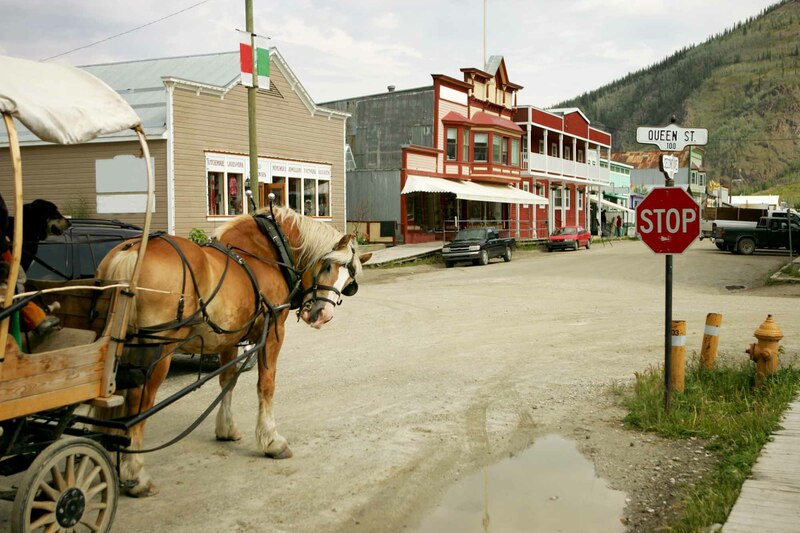 The Dawson City Historical Complex preserves 18 buildings in Dawson City, and their surroundings, as they existed during the Klondike Gold Rush . This complex has preserved the varying architectural styles, from pioneer boom-town, Victorian and Edwardian, prevalent during the period. Watson Lake's signposts, started by a homesick American GI in 1943, help tell the story of the construction of the Alaska Highway. In Whitehorse, the MacBride Museum of Yukon History has a collection of more than 30,000 artifacts documenting the history of the place, people and natural surroundings. In 2013, the museum welcomed nearly 25,000 visitors. Pierre Berton, Klondike (1958); K.S. Coates and W.R. Morrison, A History of the Yukon (1988); L.-E. Hamelin, Canadian Nordicity: It's Your North Too (1979); K.M. Lysyk et al, Alaska Highway Pipeline Inquiry (1977); C. McClellan, Part of the Land, Part of the Water (1987); W.G. MacLeod, The Dempster Highway (1979); D.H. Pimlott et al, eds., Arctic Alternatives (1973); K.J. Rea, The Political Economy of the Canadian North (1968); William C. Wonders, ed., The North (1972); M. Zaslow, The Opening of the Canadian North, 1870–1914 (1971). P. Berton, Klondike (1958); K.S. Coates and W.R. Morrison, A History of the Yukon (1988); L.-E. Hamelin, Canadian Nordicity: It's Your North Too (1979); K.M. Lysyk et al, Alaska Highway Pipeline Inquiry (1977); C. McClellan, Part of the Land, Part of the Water (1987); W.G. 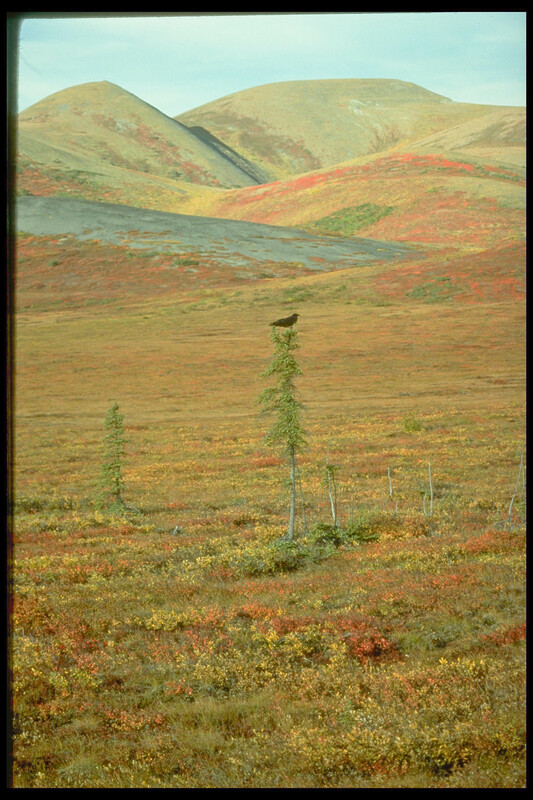 MacLeod, The Dempster Highway (1979); D.H. Pimlott et al, eds, Arctic Alternatives (1973); K.J. Rea, The Political Economy of the Canadian North (1968); William C. Wonders, ed, The North (1972); M. Zaslow, The Opening of the Canadian North, 1870-1914 (1971). Gouvernement du Yukon Votre portail pour tous les prgrammes, les services et les renseignements sur le gouvernement du Yukon. Sam SteeleVoir la Patrimoine Minute sur Sam Steele, le surintendant de la Police montée du Nord-Ouest. Par Historica Canada. Voir aussi les ressources pédagogiques en ligne.